New Years party invitation… You were so ready to have Blassssstttt and eat, drink and get drunk. You have this strapless black, body hugging, silky, elegant dress studded with a diamond lace ready for you to ROCK. You have been, wanting to wear this on such a special ocassion… Only to find out YOU don’t fit in it any more…. somehow you managed to kick the thought out of your mind and still went ahead to the party with another dress …. But You couldn’t rock the party and You couldn’t ignore the fact that you have put on…. Has this ever happened with You? It has happened with me before till I found out this one true solution. BEST wayto incorporate abundant fresh produce in your daily diet is SMOOTHING…. 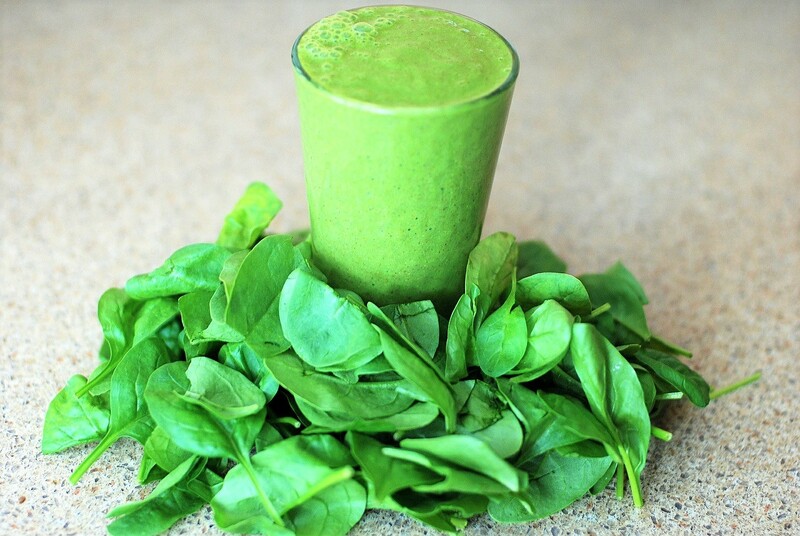 I have started this 4 ingredient smoothie recipe regime..
Spinana Smoothie – Spinach, Banana, Orange Juice and Almonds. Spinach is high in nutritional value. It is rich in antioxidants and iron. Spinach is also an excellent source of vitamin K, vitamin A, vitamin C and folic acid. It is good source of manganese, magnesium, iron and vitamin B2. Vitamin K is important for maintaining bone health and it is difficult to find vegetables richer in vitamin K than spinach. I can keep going on and on with its nutrition but I am sure you are already convinced about the goodness of this Popeye’s Super green juice…. Bananas are well known for their potassium content, The potassium in bananas can help prevent muscle cramps after exercise. Banana contains vitamin C, vitamin B-6, manganese and fiber. A banana provides some iron, magnesium, calcium and phosphorus as well as vitamins A and E, folate, carotene and choline. Bananas also contain trace amounts of many amino acids. Most importantly, a banana in morning will start your day off right and will give you the energy to make it through to lunch without snacking. There’s a compound in spinach called oxalic acid, which blocks the absorption of calcium and iron. An easy way to solve this problem is to pair spinach with a food high in vitamin C. Needless to say Orange juice is quickest easy way to get your daily dose of Vitamic C and it tastes awesome. Almonds are extremely good for your heart. Almonds are rich in the vitamins and minerals that help build a healthy heart, especially vitamin E. It contains many protective nutrients - calcium and magnesium - for strong bones. Almond contains phytochemicals, which may help protect against cardiovascular disease and even cancer. Most of the fat in almonds is monounsaturated, also known as the "good" fat. This little nut is also loaded with minerals like phosphorus and zinc, as well as lots of healthy fiber. For more such helpful, healthy and hassle-free tips, subscribe to our blog and join us on Facebook. Do you want to get smarter?